Admission is free. For more information, visit the Elmhurst History Museum’s website at http://www.elmhursthistory.org/317/Upcoming-Exhibits or call 630-833-1457. Sunday, Tuesday through Friday 1-5 p.m., Saturday 10 a.m. to 5 p.m. Anyone old enough to remember the onslaught of disco music in the late-1970s knows this genre of dance music wasn’t exactly a hit with rock fans. Disco music was divisive — people either loved it or hated it. 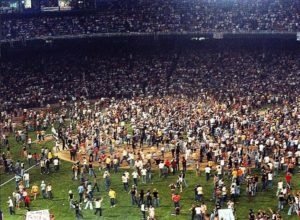 And nothing was more famous for getting the disco hate on than Disco Demolition night, held at Comiskey Park on July 12, 1979. Many of us and other Chicago area Toyota dealers remember that night, which is considered to be the most successful promotion in Major League Baseball history. Read on and we’ll tell you how it all went down that evening. Disco Demolition Night, originally known as Teen Night, was a collaboration between the Chicago White Sox and radio station WLUP-FM. In an attempt to boost sales for a twinight double-header against the Detroit Tigers, the radio station came up with a promotion — all fans who brought a disco record to the game were admitted for 98 cents. (The fee was chosen because WLUP was 97.9 on the radio dial.) The records would literally be blown up on the field. Chicago shock jock Steve Dahl spearheaded the promotion, inviting listeners to bring in records they wanted to see destroyed. People came from all over Chicagoland, some for the game, and many just to watch disco albums explode. The sold-out event left about 20,000 people outside the stadium. Many jumped turnstiles, climbed over fences and crawled through windows to get into the stadium. The official turnout was reported at 47,795, but White Sox owner Bill Veeck estimated it to be between 50,000 and 55,000. Because the collection box for the albums was too small, many fans brought their records to their seats. While security was busy trying to prevent gate crashers from entering the stadium, fans began flinging albums onto the field like Frisbees. Other items soon followed, including firecrackers and bottles. The game had to be stopped numerous times. At the end of the first game, a box of records was brought out onto the playing field and detonated amidst a cloud of smoke and flying record fragments, creating a large hole in the outfield grass. Then all hell broke loose as thousands of people stormed the field and proceeded to tear the stadium apart. It took the Chicago police in full riot gear to restore order. The field was too damaged to play the second game, resulting in the White Sox forfeiting the game to the Tigers.